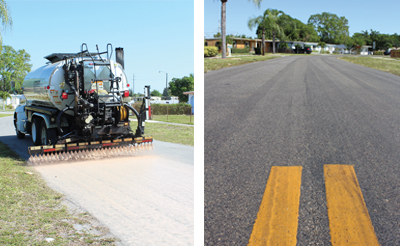 The City of Miami Gardens, FL, selected this residential road for its first preservation treatment. I live in a gated community, and along with the amenities, the main reason we moved here is to enjoy the surrounding nature. During my daily walks with the dog, I see bald eagles, roseate spoonbills, herons, cranes, and egrets galore. The pond in the back yard attracts ducks and cormorants, and the kids love to fish there. All of this deserves our protection, so I spend a significant amount of my time educating cities and counties, and more recently, private communities, on how to preserve our natural environment while preserving their pavements. These are not mutually exclusive goals. In fact, the wonderful part is that proper road preservation actually enables us to fulfill our obligations to the environment around us. Some thoughtful consideration to the environmental impact of your roadwork choices will allow your community to lower the life-cycle cost and the environmental impact of your most valuable fixed asset, ensuring that the natural world we treasure will be preserved for future generations. When roads last longer, less construction activity takes place and that means less emissions and less disruption to residents. This article will focus on why pavement preservation is a more sustainable approach and how to ensure you make the right choice for your community. “Green” may be one of the more overused buzzwords today, but the mantra of “Reduce, Reuse, and Recycle” remains as relevant to roads as it is to other aspects of our lives. Reduce is the word most directly related to pavement preservation. The first thing to understand is that all major road construction activities contribute negatively to our environment to some degree. For example, paving your subdivision requires trucks, which expend diesel fuel to transport the asphalt mix to the road. Subsequently, the hot mix asphalt itself, when heated to high temperatures, creates greenhouse gas emissions. The primary goal of preventive maintenance treatments then is to reduce the frequency of performing those major rehabilitation projects that negatively impact both the environment and our pocket books. Preservation = Reduce…Reduce = Sustainable. There isn’t a wrong time to think about sustainability. A comprehensive, life-long approach is the right strategy to employ for HOAs. Whatever shape your roads are in, there is always the opportunity to select a more sustainable approach. If your roads have seriously deteriorated and need to be resurfaced or reconstructed, you can use a warm rather than hot mix asphalt, or you can incorporate a reuse/recycle technology such as cold in-place or full depth reclamation. • Warm mix asphalt uses chemical additives that allow asphalt plants to produce an asphalt mix at lower temperatures, thereby reducing greenhouse gas emissions and short-term aging of the asphalt mix. • Both cold in-place recycling and full depth reclamation rehabilitate pavement by recycling the road already in place. The existing road is pulverized. Then a stabilizing additive is mixed in with the recycled material, and the recycled mix is used as the base. In this way, the old road becomes new base material that can then be overlaid with warm mix asphalt. Since both these processes are performed in place, there is less hauling and reduced impact to adjacent roadways. Once your rehab project is complete, the time is right to implement a pavement preservation program that will put your HOA on the right path for a truly sustainable infrastructure. An asphalt distributor applying asphalt rejuvenator on a roadway in Miami Gardens, FL. Below is the same pavement, open to traffic, just 15 minutes after treatment. Since roads begin to deteriorate in the Florida sun the day they are paved, the first goal in preserving them is to extend their working life, postponing their inevitable deterioration and replacement for as long as possible. To that end, HOAs must evaluate the sustainability of the existing technologies. • Maltene-based vs. Solvents—If the product you are considering is marketed as a rejuvenator, determine whether it is maltene-based or includes a solvent. 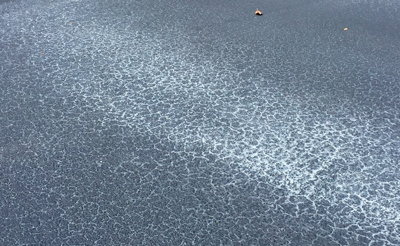 This Leesburg parking lot was sealed using a coal-tar product. Severe cracking, like that shown here, if not properly treated, can result in the release of harmful PAHs into the catch basin, and from there into area ponds. • Maltene-based rejuvenators actually repair the asphalt binder by restoring to it the maltene compounds that were lost through oxidation, thereby reducing material viscosity by like-component replacement. The result is a softer asphalt binder with durability equal to the original asphalt binder. • So-called rejuvenators made up of agricultural-based solvents only dissolve the damaged asphalt binder with components foreign to asphalt’s natural composition. These solvents dissolve whatever asphalt components remain, which has the effect of softening the asphalt, but such mate-rials do not replace the missing maltenes and are therefore unable to restore pavement durability. Looking for products that are asphaltic in nature and that contain the maltenes originally present in the asphalt binder will ensure the extended service life of HOA roadways while protecting the environment of our communities. How can something inherently harmful to the environment be environmentally sustainable? The longer the service life between road replacements, the less the environmental impact. By extending the life cycle of roads through proper preservation, HOAs can reduce the frequency of expensive, environmentally harmful reconstruction projects. 2) What defines sustainability on a product level? Just because the product is made from a recycled or biodegradable additive doesn’t make it a sustainable product. While the product itself may be “green,” its effects may not support sustainability. Does the product extend the life of the pavement, reduce VOC emissions, improve the quality or safety of water run-off? Or is it merely “greenwashing”— a gimmick rather than a true benefit? 3) What is the best way to quickly evaluate a product’s performance claims? The Internet! Look for studies from reputable agencies such as the FHWA, state DOTs, EPA, USGS, APWA, and local public works agencies. Beware of product manufacturer claims that are not substantiated by third-party test data; be especially wary of products that don’t have any test data at all supporting their performance claims. 4) What makes asphalt rejuvenation a sustainable approach? By extending the life of the pavement and lowering the lifecycle cost of your roadway asset, HOAs can reduce environmental impact by avoiding major reconstruction for as long as feasible. Of course, this only happens when the product you use to rejuvenate your pavement actually works. That is the key area to focus on when researching which product to use. 5) What is coal tar, and how do I know if the product contains coal tar? Coal tar is a thick, black by-product of the carbonization of coal for the steel industry. Always ask your contractor or supplier to provide the safety data sheet for the material you are considering, and look for the words “coal tar,” “refined coal-tar pitch,” or other similar terms. You can also look for the Chemical Abstracts Service (CAS) number 65996-93-2. This time of year, I frequently think about what a blessing it is to live in such a beautiful state. Florida boasts an amazing and diverse ecology. I think we can all agree it’s worth paying extra attention to how we preserve not only our pavements, but also our environment, for future generations. By simply asking the right questions, we can adopt more sustainable pavement preservation practices that will improve the quality of life for all of us. Technical Representative For Pavement Technology Inc.
Chris Evers has served as a technical representative for Pavement Technology Inc. since 2011 and has been involved in the road building business since 1996. He is a past president of the APWA Florida Chapter and an active participant on its Legislative Affairs committee. He founded and continues to moderate the annual APWA International Public Works Director Roundtable and was also instrumental in founding the Florida Pavement Preservation Council. Evers is a popular pavement preservation educator/speaker throughout Florida and resides in Vero Beach. For more information on Pavement Technology, visit www.pavetechinc.com or contact Evers via info@pavetechinc.com.